The 1920s are known for their idealized flapper girl, with her boyish figure. The waist had all but disappeared or appeared dropped from it’s proper anatomical location, making the hips seem slimmer, and busts were minimized. By the 1930s the waist was reemerging, lines were more graceful, curvier and the overall clothing more elegant and lady-like. The waist was back, but the figure was still very smooth and idealized. So what is a girl to do with her curves? This isn’t the Victorian era. Corsets weren’t employed by the general populace to completely rearrange the figure, but it did need it’s “unlovely” bulges smoothed out. You’d be surprised what was considered unlovely bulge. According to one ad, the curve at the small of ones back was unsightly. It was referred to as “Lordosis Backline.” Wikipedia says that Lordosis is the normal inward lordotic curvature of the lumbar and cervical regions of the spine, but an excessive curve is commonly known as a sway back. I don’t know if the phrase “Lordosis Backline” was commonplace or a marketing ploy used to exploit a real condition, but more women than not, wore their foundations 14 – 16 hours a day. Another ad has a little girl asking her mother if she will “stick out” like her when she’s older, with dad looking on, snickering. How, pray tell, do you get rid of that curve, that “figure fault”? By smoothing out the backside! Look at images of Hollywood starlets in their 1930s evening gowns and you will notice that the bum was not at all prominent. In fact it’s lack was a little boyish. Restricting undergarments went all the way down over the bum or to the thighs. This is the beginning of the switch from corsets to girdles and the era saw a surge in pre-made garments and professional made-to-measure items. Inevitably there were some holdovers to the tried and true corset and others may have desired more “smoothing” (more here meaning corseting, compression), hence the variety. 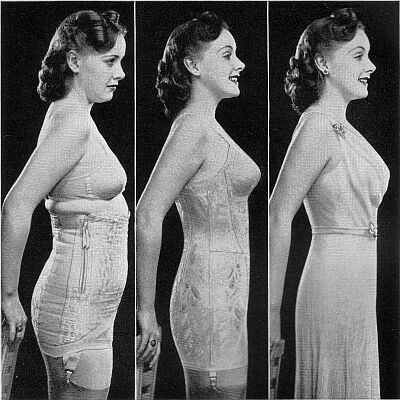 The biggest factor in going from corset to girdle must have been the wider range of fabrics available. Corsets of the previous centuries could only constrict. In fact there is a fabric made specifically for corsets. It’s woven in such a way that it has almost zero stretch. It’s called coutil and is traditionally a very tightly woven herringbone (there is a more modern satin as well). Real, good quality corsets, even today, are made with coutil. Period. There can be a fashion fabric outer layer and a lining, but if the main material isn’t coutil (and spring or spiral steel bones, but that’s a different conversation), it won’t last and the shape it gives you won’t stay true. With the advent of man made fabrics girdles could be made that smoothed and gently compressed, but allowed the wearer more range of movement. Some garments were constructed mostly of coutil with some stretch (possibly elastic or the period equivalent of power-mesh) added in gussets across the thigh and sometimes as a top band. I think of these as transition garments and this is what I will be making for this 1930s project. If you do a search for “1930s corset” you aren’t going to get many hits. Search “1930s girdle” and you’ll get some. Search for a specific company’s garments and you’ll get a lot more info. 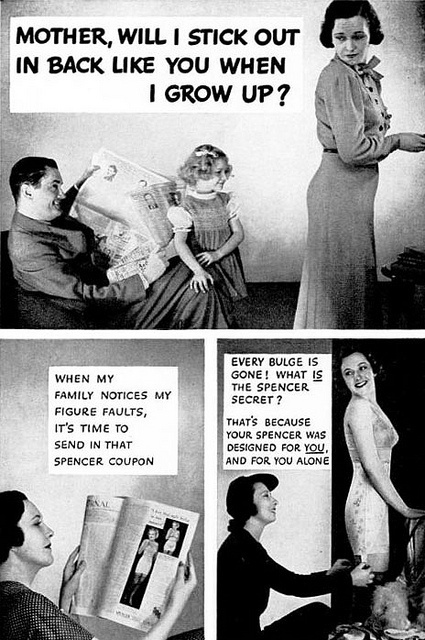 Try “1930s Spencer” and you start to get somewhere. Better yet, visit Corsetiere.net and you’ll get a plethora of information on various companies’ garments through their history (through today in a couple special cases!). Not finding an period corset patterns, but finding many ads for corset makers of the times, tells me that corset making as a home art was largely dead or dying by the 1930s. There are some patterns for period girdles, but I’m not looking for stretch in this case, nor was every woman at that time. 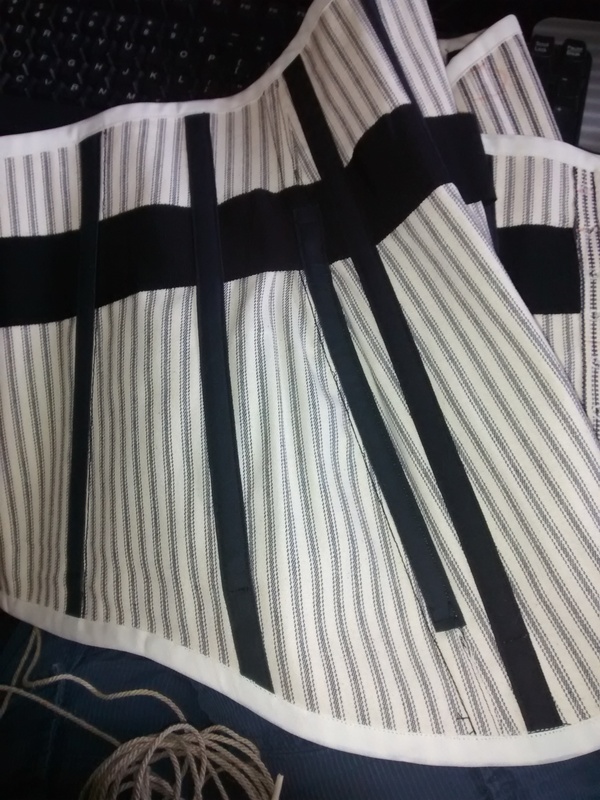 There is nothing that says I can’t make my own 1930s corset, so I will. As for the shape of the 1930s foundation garment, whether it’s a corset or girdle, it hadn’t changed much from the early century. It was long at the thigh and came to some height between directly under the bust and the waist. The single bra+corset/girdle garments are not something I want to try as a first shot and some are actually a long line bra over a corset/girdle. What I’ve found are several patterns or variations on a couple patterns from about 1911-12 that I plan to test as is, then modify. One has 5 panels per side and will be my basic model. Another has a couple shaped gussets included. While I like the latter’s shape, the pattern doesn’t lend itself to enlargement as easily as the other. My plan is to make the 1911 and figure out the gusset placement, modified for power mesh or the like, after. Here are the rushed, but final pics from the dual purpose corset, version one. This corset was developed and made in a hurry to get our gal closer to the Victorian shape. The first project was a Victorian-esque costume. More details on that later. It reduces her waist by 4″. 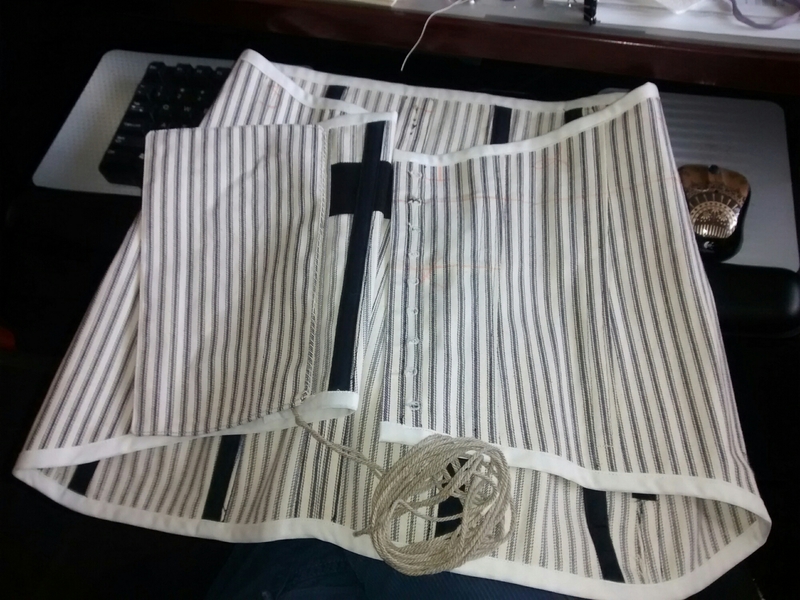 The corset is made of heavy ticking fabric. That’s not ideal for a corset. As I’ve said before, there is no substitute for coutil. Since I didn’t have any white on-hand I had to substitute something heavy that would stretch as little as possible. Ticking does stretch, but less than denim and less than plain weave canvas. Nope, not removing the orange markings. I said down and dirty and fast and I meant it. I can remove them after Halloween. Above you can see some of the garment seams covered by bone tape, which is a flattened, heavy-duty, tube of fabric. About 1/8″ in on both sides is an indented channel, which is a sewing guide. There really is no substitute for this stuff either, at least not if you are making a sturdy garment that will shape the wearer. It encases the bones which are 1/4″ spring steel. The front opening uses 1/2″ spring steel bones. The other thing you’ll notice is the black ribbon at the waist. This is called the waist tape. It is technically Petersham Ribbon. It’s a ribbed ribbon similar to grosgrain ribbon (but that is not a substitute). I’m not entirely sure, but I believe those ribs are woven, unlike grosgrain, which I believe is imprinted. Don’t quote me on that. The ribbon is not stitched down along its edges; it’s only attached where ever the bone tape crosses it. It serves as a floating anchor, taking some of the strain of the waist, which has the most tension. This is key since I had to use inferior fabric. There is one bone on each side that does not completely cover it’s corresponding seam. This is unfortunate because that seam will fray where uncovered. However, the bone only needed to extend down part of the seam, so I didn’t waste the tape. Several of the other bones are in fact shorter than their casings. Ideally I would have used a busk opening, but I didn’t have one the correct length. Busks make getting in and out of the corset much easier. Later corsets used some materials that had stretch (though they often used coutil in conjunction), which allowed them to use other openings like hook and eye. What makes this more of a 1930s corset is the shape and length. It goes from natural waist to hips. It shapes, as corsets are meant to do and, the length – completely covering the hips and bum – also smooths, which will help achieve the 30s smooth and minimized bum silhouette. Version two will be made of coutil and a bit of power net at the top of the thigh to aid in walking and sitting. It will also feature garters. Most importantly it will be front opening and back lacing. I plan to use button holes instead of the standard grommets (heavy duty ones are used, not the cute little ones you find in the usual fabric store). 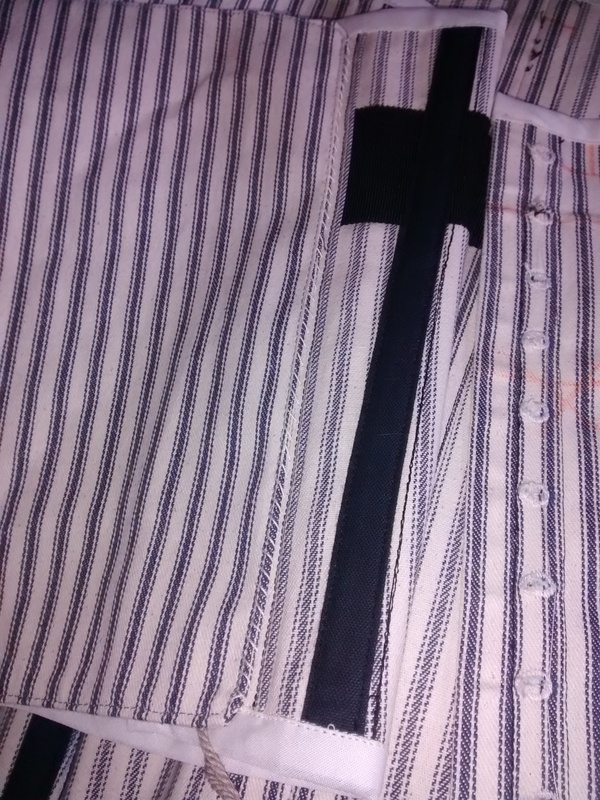 My theory is that the button holes and a flatter cording will give a less noticeable opening, which is ideal for the streamlined garments of the 1930s. 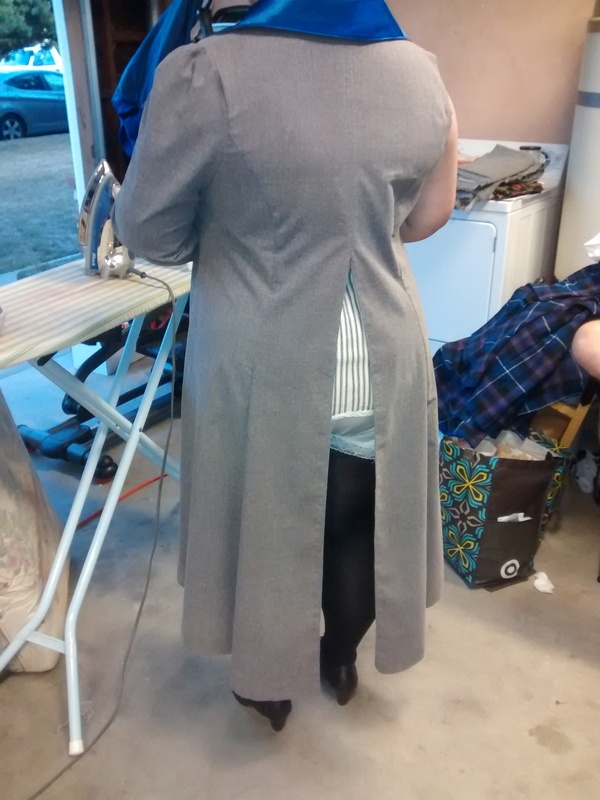 Here’s the tailcoat in progress. The second sleeve has now been attached, and it’s hemmed. Everything is going well. I made a small for adjustment to the bust. 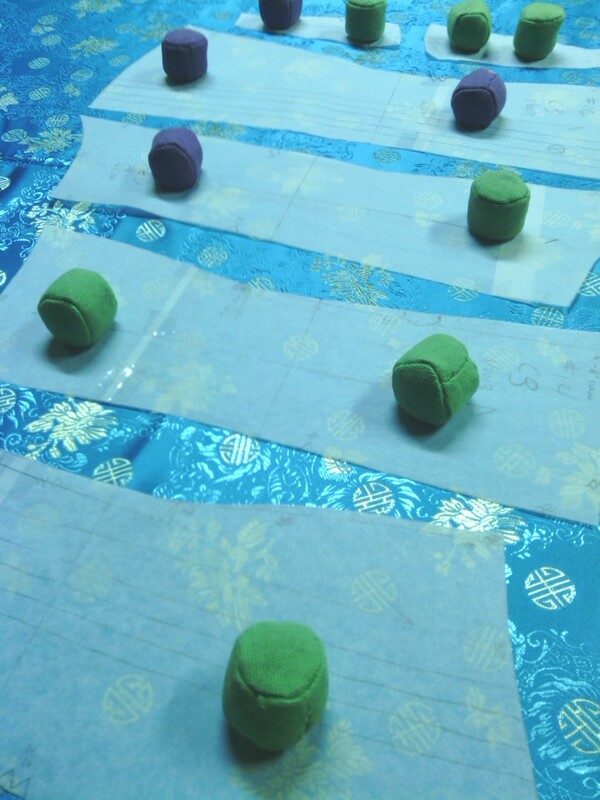 Now I just need to match the shape of the facing to the new line and add the embellishments to the cuffs. Should be complete Friday and I’ll will update with full costume shots. Everything about this post from Witness2Fashion is so true for all custom garments. Bonus – it’s got sewing photos and ads from the 1930s. Source: Good. Fast. Cheap. Pick Two. You may be wondering why this bridal corset is turquoise. It’s a unique corset for a unique bride! C has a beloved pair of boots, which she plans to wear with her wedding dress – a frothy, bustled, strapless gown, bustle, corset and boots! 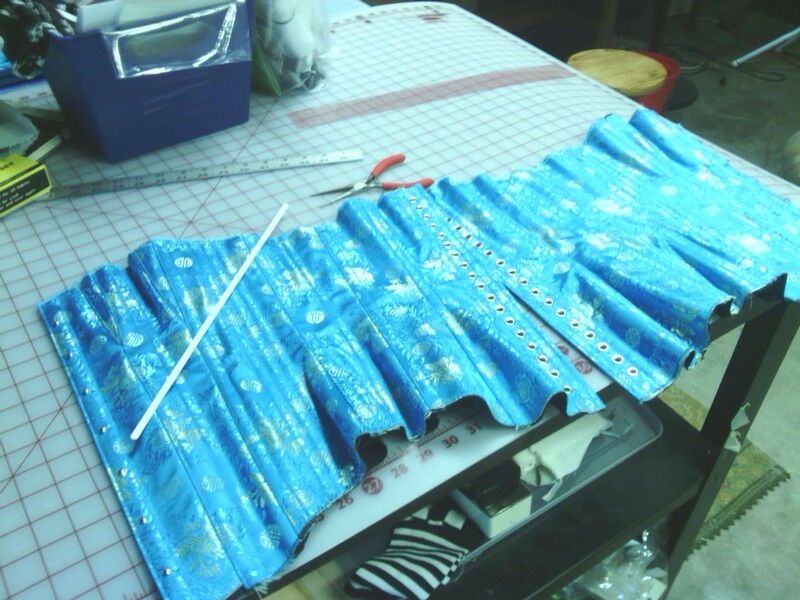 After talking with her and her mom, taking measurements and doing a couple fittings we determined the right sizing and that this corset will see additional wear as part of a costume. Everyone has a unique shape and squish factor and how tightly you want to lace must be taken into consideration. This is not to be confused with “tight lacing” or “waist training”. Should that be your desire, research, research, research and consult your doctor before you begin. Pattern weights save the day!